In the context of this document, the following terms and defined meaning shall apply. “SYNERGY” means Synergy Business Events (Pty) Ltd the Managing Agent. “EXHIBITION CENTRE” means the Inkosi Albert Luthuli International Convention Centre and Durban Exhibition Centre, Durban, KwaZulu-Natal. “EXHIBITOR” means each Exhibitor who has contracted with Synergy Business Events (Pty) Ltd to exhibit its product at Africa’s Travel Indaba. “PRODUCT” means the declared merchandise, expertise and/or product range of the EXHIBITOR which it contracts to exhibit and/or promote at Africa’s Travel Indaba from its FACILITY. “FACILITY” means the exhibition space allocated within Africa’s Travel Indaba by Synergy Business Events (Pty) Ltd to and for the exclusive use by the EXHIBITOR in terms of the contract. “CONTRACT” means the agreement concluded between SYNERGY and the EXHIBITOR in terms of which the FACILITY is hired for Africa’s Travel Indaba which is governed inter alia by the General Rules and Regulations for Exhibitors (the “RULES”), which RULES are obtainable on request of the EXHIBITOR and which will be sent to the EXHIBITOR with the CONTRACT and Tax Invoice. Any reference in this Agreement to one of the three genders, or to either singular or plural number, shall in the appropriate context be deemed to refer to any other gender or number, as the context may require. 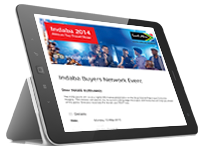 Applications can only be made by using the official stand application forms on the Africa’s Travel Indaba website, www.indaba-southafrica.co.za. Applicants are requested to fill in the forms carefully and correctly. Receipt of application does not imply any subsequent entitlement to participate in the exhibition. Details entered by the exhibitor on the application will be deemed to be correct as these details will be pulled through to the contract and trade catalogue. A minimum stand size is 9m². The net stand rental is for floor space only per square meter and excludes Shell Scheme. The inclusion of the RULES as an integral part of the CONTRACT constitutes a condition precedent to the CONTRACT becoming of force and effect between the parties to the CONTRACT. The EXHIBITOR hereby unconditionally undertakes to procure that each and every of its employees, agents, contractors, invitees or persons falling under its direct or indirect control while present upon its FACILITY or otherwise engaged by the EXHIBITOR upon an activity elsewhere upon the EXHIBITION CENTRE, shall unreservedly respect, comply with and fully adhere to the RULES. Any contravention of this undertaking, will constitute grounds for the immediate invoking of the breach provisions. Neither the CONTRACT nor any right nor interest thereunder may be ceded or assigned to any other party without the prior written consent of Synergy Business Events (Pty) Ltd having been first obtained, which consent may in fact in its sole discretion be unreasonably withheld. The contract shall be governed by the laws of the Republic of South Africa. Whilst every effort will be made to meet the requirements of exhibitors taking part in Africa’s Travel Indaba, Synergy Business Events (Pty) Ltd reserves the right to make any alterations which they may consider necessary or to alter the positions of any of the facilities within Africa’s Travel Indaba, or to take any other steps considered necessary in connection with Africa’s Travel Indaba in which event the exhibitor shall have no claim of whatsoever nature and kind arising from whatsoever cause against Synergy Business Events (Pty) Ltd. The allocated stand may not be exchanged for that of another exhibitor, nor may it be transferred either partially or completely to a third person unless agreement has been reached with Synergy Business Events (Pty) Ltd and lodged in writing. Should notice of intended cancellation be received by Synergy Business Events (Pty) Ltd at least 3 (three) months prior to the commencement of Africa’s Travel Indaba, 60% of the full contract price shall constitute an agreed liquidated damages amount which Synergy Business Events (Pty) Ltd shall be entitled to retain. The balance of any monies held by Synergy Business Events (Pty) Ltd, to be reimbursed to the exhibitor. Should an Exhibitor seek to cancel the contract within 3 (three) months or less prior to the commencement of Africa’s Travel Indaba, it will NOT become entitled to the refund of any monies, it being acknowledged that Synergy Business Events (Pty) Ltd will not in the circumstances be able to mitigates its loses by way of obtaining any replacement Exhibitor for the facility: the full contract value will consequently in such circumstances remain owing and payable by the Exhibitor to Synergy Business Events (Pty) Ltd. The organisers shall be entitled to refuse to permit the exhibitor to reduce his stand size. Such refusal shall not however, affect the exhibitor to withdraw from the exhibition. Should the exhibitor seek to reduce his stand space within 3 (three) months or less prior to Africa’s Travel Indaba, it will NOT become entitled to the refund of any monies, it being acknowledged that Synergy Business Events (Pty) Ltd will not in the circumstances be able to mitigate its loses by way of obtaining any replacement Exhibitor for the facility: the full contract value will consequently in such circumstances remain owing and payable by the Exhibitor to Synergy Business Events (Pty) Ltd.
Whilst the contract shall have become established as detailed in 5.1, all rights and benefits flowing there from in favour of the Exhibitor shall remain suspended until the exhibitor shall have paid the agreed contract price to Synergy Business Events (Pty) Ltd.
Payment by the Exhibitor of the specified deposit, will convert the allocation to a secured and confirmed facility pending the final payment of the outstanding contract price by the Exhibitor in terms of clause 9.1. The act of payment of the deposit in terms of 9.2 will, in the absence of submission of a written confirmation notice, be deemed to constitute a tacit confirmation thus giving rise to the final legal ratification for the establishment of the contract. Until such time as the specified deposit shall have been paid in terms of clause 9.2, the allocation of the facility space shall remain of a tentative nature and at all times free to be re-allocated by Synergy Business Events (Pty) Ltd to any alternate exhibitor in its sole discretion and upon simple notice to that effect being given to the former exhibitor. Payment of the contract price shall be required to be effected by the exhibitor in strict compliance with the invoice terms therefore issued by Synergy Business Events (Pty) Ltd.
Only for as long as the exhibitor maintained all payments in terms of the contract on due date, will it be entitled to receive access to its reserved facility as may be necessary in the furtherance of its planning for Africa’s Travel Indaba. Failure to pay any contract monies in strict accordance with the stipulated times for payment, will constitute a material breach of the CONTRACT. The organiser shall under no circumstances be liable for any loss, theft or damage which is suffered by the Exhibitor, its employees, agents, servants, customers, clients or visitors, including but not limited to damage as a result of fire, injury, accident, floods, crowds, riot, the actions or omissions of other exhibitors, defect in the structure of the stand or in the venue, or from insufficient lighting or ventilation or resulting from leakage from or breaking of any water pipe or communication, fitting or appliance. The Exhibitor is liable for and holds the Organiser harmless against all risk in and to property brought onto the Venue by the Exhibitor, its employees, agents, servants, customers, clients or visitors including property not owned by the Exhibitor. The Exhibitor agrees and undertakes to take out such policies of insurance as may be necessary to cover any loss or other damage to it and or for which it may be held liable. Synergy Business Events (Pty) Ltd shall not be responsible for any loss or damage that it may suffer in the event of the Exhibition having to be closed during the whole period of the Exhibition or any parts thereof and in such event Synergy Business Events (Pty) Ltd shall not be liable to refund the Exhibitor any monies or portion thereof. The limitation of Synergy Business Events (Pty) Ltd liability as aforesaid shall apply irrespective of whether such damage is sustained before, during or after the Exhibition and irrespective of whether the act or commission complained of occurs inside or outside of the Venue. In the event of the Exhibition being cancelled, postponed or abandoned due to causes beyond the control of Synergy Business Events (Pty) Ltd, Synergy Business Events (Pty) Ltd may, entirely at their discretion, repay any fees paid by the Exhibitor, or part thereof, but shall be under no obligation to repay the whole part of such fee, and shall be under no obligation to repay the whole part of such fee, and shall be under no liability to the Exhibitor in respect of any damages, actions, claims, losses or expenses whatsoever. Where the Organiser agrees to repay fees, Synergy Business Events (Pty) Ltd limit of liability to the Exhibitor will be the space cost paid, irrespective of other costs incurred by the Exhibitor. 12.1.3 Should the breach materialise during the Exhibition, 7 (seven) hours, those to run between the daily period 10h00 to 18h00. By virtue of the inherent nature of the Exhibition, time as contemplated in 12.1 is acknowledged by all parties to be of the absolute essence. Without prejudice to any other right whether under common law or in terms of the CONTRACT, the parties reserves the right to any other or additional claim or claims which the aggrieved party may have against the defaulting party in law, and in the event of breach of any term or condition of the CONTRACT not being remedied, the aggrieved party shall have the right and option forthwith either to can the CONTRACT or to institute proceedings for specific performance against the party in breach and without any further notice, with or without any additional claim for damages arising from such breach. All legal cost incurred shall be recoverable by the aggrieved party on the scale of attorney and own client. The domicilium citandi et executandi shall be those addresses of the Exhibitor and Synergy Business Events (Pty) Ltd as recorded on the face hereof. The CPA in section 49(1) requires of us to bring to your attention certain aspects – we have done so by underlining certain clauses in this contract and the Exhibitor Manual which forms part of the agreement between Synergy Business Events (Pty) Ltd and the Exhibitor. The CPA in section 41 also requires us to clarify ‘any apparent misapprehension’ you may have. If you have such misapprehension DO NOT accept the agreement. The Exhibitor was not introduced to this agreement by means of direct marketing methods as contemplated in section 24 of the CPA. Synergy Business Events (Pty) Ltd did not use undue influence or tactics to induce the Exhibitor to sign this agreement. The Exhibitor considers the agreed cost of exhibition participation to be fair and reasonable. By accepting signing and initialling each page of the contract you confirm that you understand the terms and conditions and read through the EXHIBITOR MANUAL and agree to be bound thereby and, if accepted on behalf of a separate legal entity, that you are duly authorized to do so on behalf of such entity. Excluding those marked N/A, these are the only terms of this Agreement which the EXHIBITOR acknowledges having examined, and the contents of the EXHIBITOR MANUAL which are incorporated in this Agreement as if specifically mentioned and are accepted by the EXHIBITOR herewith. Africa’s Travel Indaba is a trade show and as such, under no circumstances are exhibitors allowed to sell any goods within or around the exhibition precinct. Failure to comply will result in the exhibiting company and its employees being escorted off the premises.